TAKE NOTICE THAT; Akahi Wahine, Vanessa Fimbres, Nakoa Kaahunui, Kamalani Kaahanui, Lokelani Nunes and Wayne Nunes, Real Parties in Interest, hereafter “Demandants”, is and are each under the Sovereign Authority of His Majesty King Akahi Nui, King of the Hawaiian Islands, Kingdom of Hawaii Nation, each a sovereign man or woman upon land, and not Residents to the corporate State of Hawaii, nor United States persons nor of the diminished capacity of citizen known as 14th Amendment citizen or U.S. citizen, nor a party to the social compact; a.k.a. HAWAII STATE Constitution August 21, 1959 and is unaware that the Third Party Intervener is named within the State statutes. Thus Demandants retain all unalienable God Given Rights (see Hale vs. Hinkle) as sovereign within the Kingdom of Hawai’i and separate from other governments including but not limited to within the union of states, the United States, U.S.. Inc., or otherwise called America and as such, Demandant’s are appearing specially, and not generally in regard to the above Case as the authorized representative of the artificial corporate ‘person’s’/Defendant’s/Accused/Ens legis as the corporate fictions as identified on the charging instrument (Warrants) as filed in the DISTRICT COURT FOR THE FIRST CIRCUIT HONOLULU DIVISION STATE OF HAWAII (hereafter “this case” or “this Court”). Demandants demand all of their rights at all times and waive no rights at any time. Demandants herein makes a timely demand for a Bill of Particulars or a More Definite Statement (hereafter “Demand”), whichever is applicable, which was privately served on the States Counsel’s Office. The objective of this Demand being to determine the Nature and Cause of the Complaint/Indictment filed and in the Nature and Cause of DISTRICT COURT FOR THE FIRST CIRCUIT HONOLULU DIVISION, an agency of the State of Hawaii, bringing the action in the above Court against the corporate fiction’s/ Ens legis or the sovereign, in the false nom de guerre as Demandants do not spell they’re names in all upper case letters, as that identifies a Strawminious Homo. Demandants have not at any time voluntarily submitted to the jurisdiction of this Court and have done so under threat, duress and coercion. At this time Demandants do not believe that this (foreign) Court is the proper court or venue for the Plaintiff to bring this action and Demandants challenge the jurisdiction of this foreign Court, challenge the subject matter jurisdiction of this foreign Court and challenges the personum jurisdiction of the matter. Demandants demand to be informed as to the Nature and Cause of the action being taken against Demandants. Plaintiff has no right to proceed until Plaintiff has properly responded to this Demand for Bill of Particulars so that the Demandants will have sufficient knowledge of the Nature and Cause to properly proceed. THEREFORE, Demandants herein make a Demand for a Bill of Particulars or a More Definite Statement, whichever is applicable, which will be privately served (not “filed”) on the agent for the Plaintiff in this Case; State Counsel. This Demand is made so that Demandants can determine the Nature and Cause of all actions pertaining to this Case. The questions in this Demand are necessary, imperative and material in the preparation for any Judicial Review, to challenge the jurisdiction of the court or for tort in this matter for redress of grievance, if required. The Demandants cannot adequately prepare or conduct any proper defense, relief or otherwise or remedy without this information. If either the Plaintiff or this (foreign) Court moves forward without Demandants getting the answers herein demanded, Demandants unalienable rights will be violated resulting in irreparable damage. A non responsive answer to any question set forth herein will be deemed a non responsive answer and tacit agreement to all questions. All questions must be answered under penalty of perjury as true, correct and complete. Failure to certify the answers thereto in this manner will be deemed as a non response to the all questions. If any response to this Demand raises new questions or new issues as to the Nature and Cause of the action, lawful status of the STATE, jurisdiction, judgment, orders or decrees in this Case, Demandants reserve the right to amend and/or append this Demand and submit further questions as deemed necessary. If this Demand and request for information as to the Nature and Cause of this action is not procedurally correct, Demandants demands that the agent for the Plaintiff that is served with this demand inform the Demandants of the correct procedure to obtain this information timely prior to any act or action that could or would damage or put Demandant’s rights, property or interest in jeopardy or at risk. If the person to whom this Demand is served upon is not the proper party to receive this Demand, each Demandant expects and requires that as an agent for the Plaintiff, said party will either forward this Demand to the proper party forthwith, or notify the Demandant’s of the name and title of the proper party who will get this Demand. The Principle of “Notice to the agent is notice to the Principle” applies to this Demand. This Demand also applies to any successors or assigns in this Case. The word “Nature”, as used herein, deals with the search for the agent, creator, author, producer and the powers of the court system this case is before, along with its jurisdiction and relationships to the parties and subjects involved in this case. In short, who and what is the court this case is before? What and where did it get its authority, jurisdiction and powers? What are the limits and bounds of the court? Who is and who is not subject thereto? What governments does it represent and where do those governments stand in the “pecking-order” of the system of governments that were established by We the People of the united States of America? Is this court system de jure, is it a part or agent of any de-jure or de-facto government, etc.? The word “Cause”, as used herein, deals with the search for the motive, authority, power and moving force that drives the claims and the action in this case and the justice or injustice of those claims, including any bankruptcy, title or rights. The term “Title of Nobility” is defined as any license or authority which is enforced and protected by law, which prevents and makes illegal the free exercise of an inalienable right to those not so licensed or authorized. The Constitution of the united States of America (the supreme law of the land) forbids this and the laws of all States must be in harmony therewith. The term “united States of America” is defined as the de jure union of States that comprise what is commonly called America. The term “Constitution of the united States of America” is defined as the Constitution ratified by We the People in 1787-1790. The term “Bill of Rights” refers to the first ten Amendments to the Constitution of the united States of America. The term “UNITED STATES” and “UNITED STATES OF AMERICA”, whether spelled in all upper case or mixed case letters, is defined as de facto government corporations designed to displace the de jure governments of the union. The term “STATE OF HAWAII”, whether spelled in all upper case or mixed case letters, is defined as a de-facto state government that is a sub corporation and ‘federal unit’ of the UNITED STATES and a federal enclave of the UNITED STATES. The term “County of Honolulu”, whether spelled in all upper case or mixed case letters, is defined as a de-facto county government and ‘agency’ of the de-facto STATE OF HAWAII. The term “Foreign Flag” refers to the yellow or gold-fringed military (war) flag of the United States Federal Corporation that is displayed in the court rooms of the State of Hawaii Courts. The term “Hawaii Republic” is defined as a de-facto State of the union of States that is/or was a part of the United States of America and formed unlawfully pursuant to the illegal military invasion of the Hawai’i Kingdom in 1893. The term “Republic of Hawaii” is a de-facto provisional government unlawfully created by the federal government pursuant to the illegal military invasion of the Hawai’i Kingdom in 1893. The word “defendant/accused” refers to the ‘Ens legis’/artificial corporate fiction as identified within or on the charging commercial instrument of this case. The word “pleadings” refers to the complaint/indictment and all related claims in this instant case. 1. Does the Plaintiff claim that the DISTRICT COURT FOR THE FIRST CIRCUIT HONOLULU DIVISION COURT STATE OF HAWAII has standing to hear a case wherein the property, its legal owner, and those in possession are within The Kingdom of Hawaii Nation and without the jurisdiction of the de-facto STATE OF HAWAII? 2. Since the alleged offense this case took place within the meets and bounds of the Republic of Hawaii and/or the Hawaiian Republic, The Kingdom of Hawaii and/or in the STATE OF HAWAII, does the Plaintiff define the ‘meets and bounds’ within its constitution? 3. What facts is the Plaintiff relying on to determine that the DISTRICT COURT FOR THE FIRST CIRCUIT HONOLULU DIVISION of the STATE OF HAWAII, has standing to hear the case? 4. Is the DISTRICT COURT FOR THE FIRST CIRCUIT HONOLULU DIVISION COURT(S) constitutional court of due process? 5. Are the DISTRICT COURTS FOR THE FIRST CIRCUIT HONOLULU DIVISION COURT(S) administrative unit/tribunals? 6. Does the Plaintiff claim that this case and the court that is hearing it, is outside of and/or not subject to the authority of the Constitution of the united States of America via Oath of Office of all officers of the court? 7. Is the Plaintiff and/or the Court subject to the contractual restrictions of the Bill of Rights by Oath of Office as well? 8. Does the Plaintiff’s agent(s) subscribe to the doctrine proclaimed by President Franklin D. Roosevelt in 1933 when he invoked what he called “Emergency War Powers” and under that alleged authority suspended the Constitution of the United States of America, declared a state of “National Emergency” and placed the United States in receivership to the Federal Reserve and officially placed the country under martial law including the State of Hawaii and its agencies, i.e. ; counties? 9. Is this case being heard and subject to and or under military authority, jurisdiction and venue of the “Declared National Emergency” doctrine of the United States and its federal enclave, as it operates within the STATE OF HAWAII? 10. Is the evidence of such National Emergency/ Military authority/jurisdiction found on the outside of the courthouse as well as in the courtroom via the ‘War’ flag of the ‘federal’ United States, Inc.? 11. Is this court and the STATE OF HAWAII and/or its principle the UNITED STATES, INC. subject to any control of a foreign agency as a result of being in receivership from the bankruptcy of the UNITED STATES that can effect the claimed sovereignty of these governments and/or effect or influence any part of the outcome of this case? 12. Will the judge in this case receive any ‘enrichment’ of any percentage of any so-called monetary judgment that may be laid against the Defendant(s)/Debtor(s). 13. If the judge in this case or any judge that hears this case not have a CONFLICT OF INTEREST in receiving a portion of any monetary judgment? 14. Does the Plaintiff and/or STATE OF HAWAII in this Case condone the Courts displaying of a foreign flag of war for the de-facto government that under the law of the flag signifies “Marital Law”. (under which a “federal Marshal” presides and enforces law?) WELL CERTAINLY THEY CONDONE IT! THEY’RE FLYING IT AREN’T THEY? 15. Can the court in this case/matter, operating under Martial Law protect and defend the unalienable and constitutionally protected rights of the Defendants as might exist under the American Flag of Peace? Or under The Kingdom of Hawaii Flag as described in financing statement: 2008-158-9982-4 and recorded December 6, 1996 out of necessity with the STATE OF HAWAII BUREAU OF CONVEYANCES? 16. As the Real parties in Interest we have the right to challenge the jurisdiction of the Court/tribunal, will the Court prove jurisdiction of the Court/tribunal in this case/matter production of evidence of said jurisdiction? 17. Have all the officers of this Court involved in this case taken an oath and affirmation to defend their Constitution of the United States of America, and/or the Hawaiian Republic (identify each officer and the constitutions they have taken an oath to)? 18. Do all the officers of this Court, involved in this case, maintain certified copies of their oaths and affirmations to said constitutions available on demand of the public as required (identify each officer who does)? 19. Do all of the attorneys attending this Court in DISTRICT COURT FOR THE FIRST CIRCUIT HONOLULU DIVISION STATE OF HAWAII, involved in this case, hold a valid license to practice law as issued by the Secretary of State of the STATE OF HAWAII. (identify each officer who does)? 21. Are any of the attorneys representing the Plaintiff in this case registered as agents of a foreign principle as required by law (identify each attorney who is not)? 22. Are each of the attorneys representing the Plaintiff in this case in compliance with the Immigration and Nationality Act as required by Title 8 USC §§ 1481, 1484 and 1488 (identify each attorney who is not)? 23. Is the administrative tribunal hearing this case a legislative or executive court and/or a tribunal of limited or special jurisdiction (identify specifically)? 24. Does the Plaintiff claim that the named Defendants are legally created or statutory ‘person’s’ whose name’s are spelled with all capital letters creating a ‘fictional’ Strawminious Homo and that said Defendants do not have a claim to or guarantee on the Bill of Rights via Oath of Office of all officers of the court? 25. Is the reason that the Defendants are identified with a ‘nom de guerre’ (all upper case letters) because said war name represents a “Constructive Trust” created by operation and color of law within the jurisdiction of one or more of the de-facto governments and/or does this Court require a natural person to act as ‘agent’ for same to establish joinder with the court? 26. Does this Court have jurisdiction over sovereign Citizens and/or their property and interests which are without the jurisdiction of DISTRICT COURT FOR THE FIRST CIRCUIT HONOLULU DIVISION or the STATE OF HAWAII? 27. Does this Court have jurisdiction over sovereign Citizens whose Christian appellation is spelled the same as the ‘nom de guerre’ but is properly spelled in upper and lower case letters in proper English? 28. Does this Court have jurisdiction over sovereign people whose Christian appellation is spelled the same as the ‘nom de guerre’ but is properly spelled in upper and lower case letters in proper English who are within the Kingdom of Hawai’i? 29. Does the Constitution of the State of Hawai’i operate upon the people and more specifically upon the Real Parties of Interest found within the Kingdom of Hawai’i? 30. Are the Real Parties of Interest the ‘object and the subject’ of State of Hawai’i? 31. Are the Real Parties of Interest signatories to the State of Hawai’i Constitution? 32. Are the Real Parties of Interest parties to that social compact? 33. Have the Real Parties of Interest been noticed of their LIABILITY to the statutes of the State of Hawaii Coporation? 34. If the action is presumed to be against a fictional entity (the Defendant) is the Real Parties of Interest required by law to appear and answer for the fictional entity/Defendant? 35. Is the action commenced against the so-called Defendants merely commercial action to collect revenue/monies from the so-called Defendants? 36. Is any complaint, information or indictment that might be filed against the so-called Defendants merely a commercial presentment seeking monetary payment per each ‘charge’, whereby each ‘charge’ is merely part of the commercial program? 37. Does the Plaintiff claim that the Defendants are something other than sovereign people with all the rights and powers that are inherent to the said sovereign people pursuant to Hale v. Henkle? 38. Please disclose the status of the Real Party(s) in Interest if other than sovereign people with all the rights and powers that are inherent to the said sovereign pursuant to Hale v. Henkle? 39. How is the Defendants and/or Real Party’s in Interest made subject to the liability to the statutes of the State of Hawaii? 41. If the Plaintiff claims that U.S. citizens (14th Amendment citizens) have the same legal standing and rights as sovereign people, what facts does the Plaintiff rely on to make that claim? 42. Is the Plaintiff in this case the principle party of interest, or is the pleading being brought in the Plaintiff’s name as an agent for another principle or a corporate co-business partner? 43. Does the State of Hawaii have authority to sue in its own name in and for this instant matter? 44. If the Plaintiff is an agent for another principle and if so, what is the correct name of the true party in interest? 45. Is the jurisdiction in this matter criminal, civil, admiralty (maritime contract) or of some other jurisdiction (specifically identify)? 46. Is this case being heard as a proceeding in law, in equity, in admiralty, in civilian military or some other form of proceeding (specifically identify)? 47. Did the ‘Accuser’ in this matter submit and file an affidavit of facts in support of the ‘complaint’? 48. Did the ‘Accuser’ provide a copy of the ‘TITLE’ of the Iolani Palace, the property in question showing ownership and Title in said property and will the Plaintiff provide a certified copy of the TITLE’ to the Real Parties of interest? 49. Does the ‘Accuser’ as a licensed and incorporated Fiction hold lawful or legal Right or ‘Title’ to ALL the ‘property/properties’ that have been ‘sold’ to the general public within the Islands of Hawaii since 1893? 50. 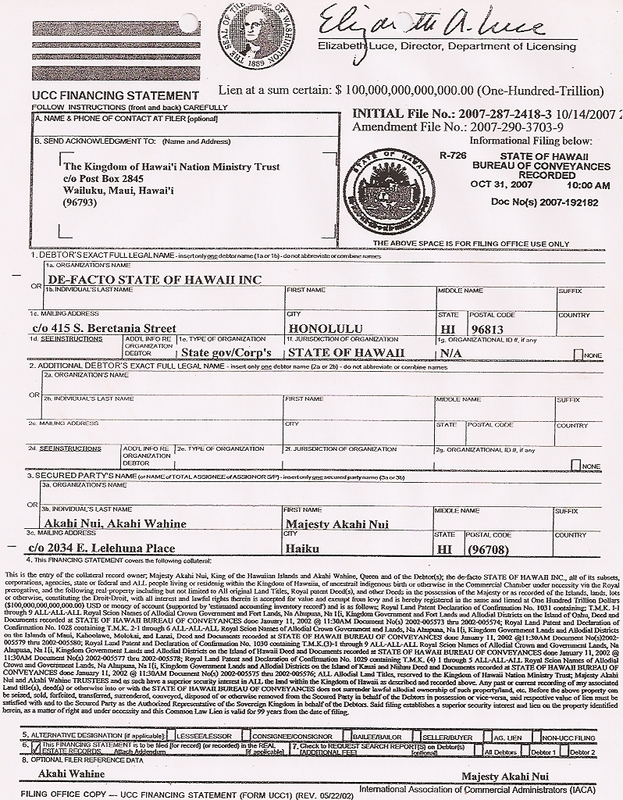 If the ‘Accuser’ (STATE OF HAWAII, INC.) does not hold and posses actual evidence of lawful Right to allow any and all land(s) to be sold since 1893 and does not hold and posses actual Titles/Deeds and Security Interest to the Iolani Palace and land property, is Plaintiff prepared to vacate all charges as associated to this instant matter or bring forth the evidence and proof of authority Plaintiff is relying upon for standing and proof of claim? 51. Is it not a felony to ‘sell’ property real and tangible without a ‘Title’ in this State? 52. Does the Plaintiff hold any documents or evidence that all land and property recorded and filed within Financing Statement No. : 2007-287-2418-3 and 2007-192182 is not reserved and owned by The Kingdom of Hawaii by and through Majesty Akahi Nui AND IS NOT HELD IN TRUST BY THE Kingdom of Hawaii Nation Ministry Trust. 53. 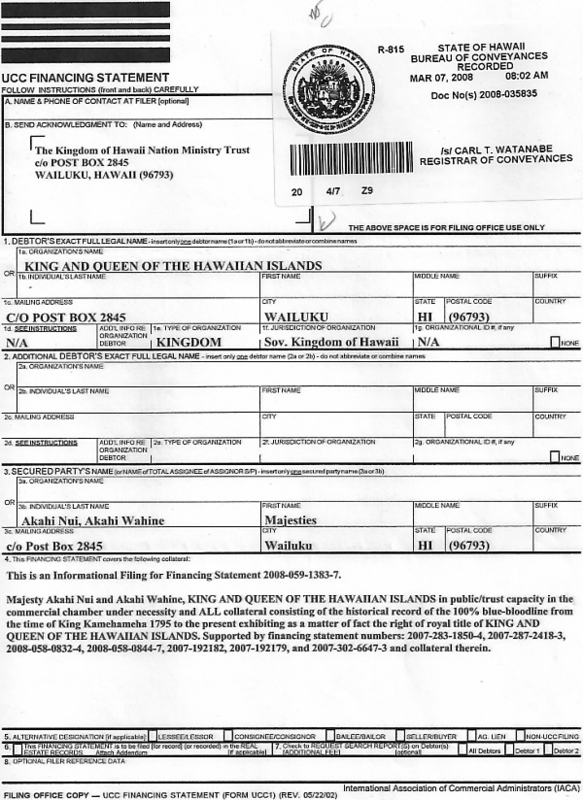 Does the Plaintiff hold any documents or evidence that Majesty Akahi Nui is not the 100% blood lineage heir to the Kingdom of Hawaii and all lands therein, and that Majesty Akahi Nui is not a direct descendant of King Kamehameha III as documented by Honorable Lorrin Andrews; In the matter of the Estate of His Majesty Kamehameha III, Judge of Probate - Cause Number; 2410 dated April 2, 1853. 54. Does the Plaintiff hold any documents or evidence that the filing of Financing Statement No. : 2007-287-2418-3 and 2007-192182 which includes ALL Royal Land Patents and Allodial Patent Lands, does not establish a Superior Security Interest and lien on the property including but not limited to the Iolani Palace identified therein with The Kingdom of Hawaii Nation. 56. Does the Plaintiff hold any documents or evidence that ALL alleged land owners, companies, title companies, corporations, or whomever, sold, transferred or signed titles, deeds, quiet title action(s), quick claim deed(s), any other land contract(s), transitions since 1853, acquired ‘lawful title’ to any of the said lands found within the Kingdom of Hawaii Nation which includes but not limited to the Iolani Palace. 57. Does the Plaintiff hold any documents or evidence that the past and current titles, deeds or otherwise that were sold, bought, transferred, exchanged or otherwise, that the so-called ‘buyers’ did not only acquire ‘Warranty Deed’, being a promise as to a clear title and/or that clear and lawful Allodial Title is not held by the Sovereign King Majesty Akahi Nui for the Kingdom of Hawai’i Nation by and through the The Kingdom of Hawaii Nation Ministry Trust is not the holder of the Original Title to the property as described in financing statement 2007-287-2418-3 and 2007-192182? 58. Does the Plaintiff hold any documents or evidence that a Public Notice from the Kingdom of Hawaii through its 100% lineal heir, stating ownership and Superior Security Interest in the four Hawaiian islands was not published locally, and abroad, exceeding the statutory time limit and that same was rebutted, contested or objected to by you and/or your office and/or Plaintiffs office or designate State corporate officer? Further, does Plaintiff hold any documents or evidence that a Public Notice, Affidavit of fact, confirming superior security interest and non rebuttal to same was not published locally and abroad beginning November 8, 2007 and ran for 6 consecutive weeks? 59. 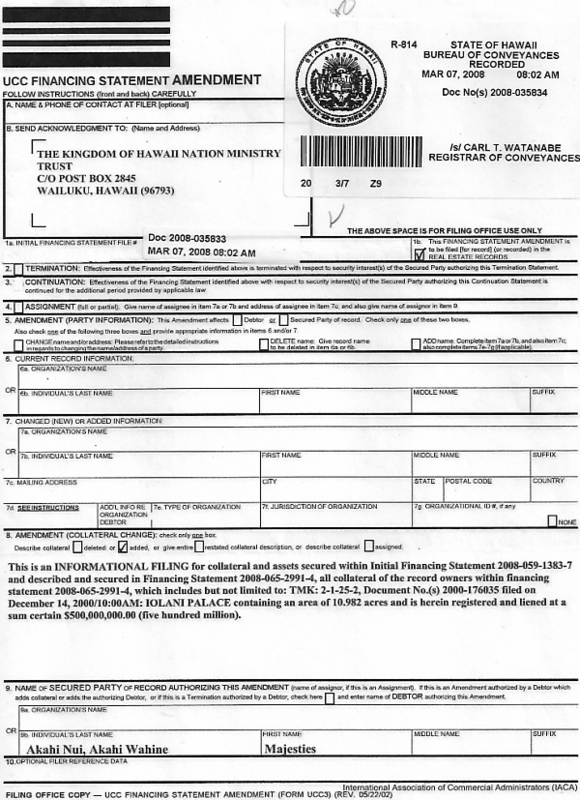 Does the Plaintiff hold any documents or evidence that Plaintiff State of Hawai’i by and through Linda Lingle acting in the corporate capacity as governor of the State of Hawaii does not agree that via said Public Notices, being un-rebutted, stand in the public record as true and that the world at large has failed to object? 60. Does Plaintiff hold any documents or evidence that any party, person, corporation or otherwise, including but not limited to DEPARTMENT OF LAND AND NATURAL RESOURCES, or any other person or entity at anytime has produced lawful title superior to that held by Majesty Akahi Nui’s? 61. Does Plaintiff hold any documents or evidence that Plaintiff, THE STATE OF HAWAII, Linda Lingle, as acting Governor of the State of Hawaii has in effect acted honorably by investigating all the facts dealing with the existence of the Sovereign King Majesty Akahi Nui for the Kingdom of Hawai’i Nation before making decisions, choices, executive orders or otherwise and/or that Plaintiff does not have a personal conflict of interest in such by perceiving to own land or exist within the Kingdom of Hawaii Nation and/or have authority within and over same? 62. 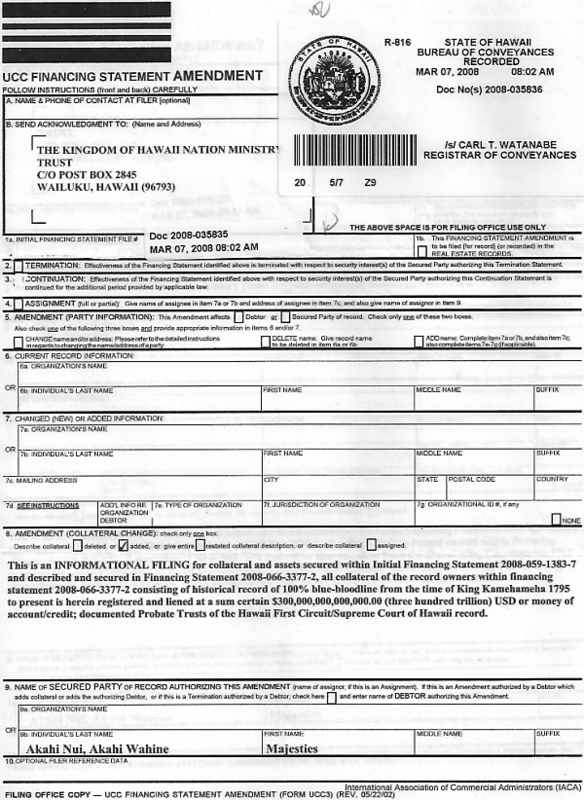 Does Plaintiff hold any documents or evidence that Majesty Akahi Nui, does not have Right of Entry, Right of Possession, 100% Ownership and a $500,000,000.00 (Five-Hundred-Million) Security Interest (lien) documented within Financing Statements: 2008-059-1383-7; 2008-035834 and 2008-035833 to the IOLANI PALACE? 63. Does Plaintiff hold any documents or evidence that Majesty Akahi Nui as a direct descendant of King Kamehameha III does not have a lawful Right, as 100% Lineal Heir, to be in full control and Rein as Sovereign King over all of the Kingdom of Hawai’i Nation, including but not limited to every acre of said soil, land and property on and within these Hawaiian Islands, including but not limited to the Iolani Palace? 64. Can the Plaintiff by and through STATE OF HAWAII Counsel locate, exhibit and provide the ‘nexus’ to any liability to the statute(s) in relation to the so-called charge(s) as laid against the Real Parties of Interest or the Third Party Intervener’s and/or the Accused/Defendant’s? 65. Does Plaintiff through counsel have the duty and obligation to provide all evidence to the Real Parties of Interest or the Third Party Intervener’s and/or the Accused/Defendant’s that would be favorable to the so-called Defendants? Dated: ____________________ , 2008 A.D.